Heat a nonstick high-sided pan with vegetable oil. Add finely chopped onion and celery. Sauté on medium-high heat for about 3 minutes until vegetables start to soften. Add mushrooms and continue cooking another 3 minutes. Season with salt, pepper, parsley and thyme. Squeeze sausage meat out of casings into vegetable and apple mixture. Break up with spoon. Add Gala apple and sauté 2 minutes. Add dried sage. When sausage meat is cooked through add bread pieces. Mix well with spoon to incorporate. Pour apple juice over the stuffing to moisten the mixture. Add chicken stock and continue stirring to combine. 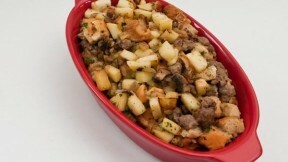 The stuffing should be moist and cohesive, with distinctive chunks of apples, mushrooms and sausage. More liquid may be needed depending on how dry the bread was. Add extra apple juice as needed. Put stuffing into stuffing bag, cheesecloth or nylon stocking if it is to go inside the bird, otherwise place in a buttered baking dish that can be covered with foil or lid. Bake 30 to 45 minutes at 350 degrees.